The political crisis in Guatemala can be explained really quite simply. 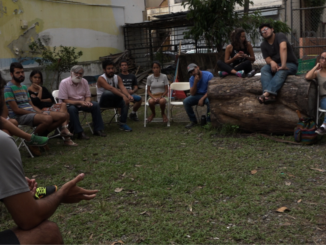 “The state is broken,” as Leiria Vay, a leader from the the Campesino Development Committee (CODECA), told Upside Down World. But the only thing standing in the way of this cartel-like Congress is civil society, and it may take a repeat of the 20 straight weekends of protests which helped unseat former President Otto Pérez Molina to resolve this current political crisis and corruption scandal. Since Aug. 27, grassroots organizations have taken to the streets to protest government corruption and to demand embattled President Jimmy Morales’ resignation, following an early morning video that declared Ivan Velásquez, a Colombian lawyer and lead investigator of the International Commission Against Impunity in Guatemala (CICIG), the U.N. backed anti-corruption body, a “persona non-grata.” Morales and his brother and son had been under the microscope of investigators, and CICIG had requested permission to probe the president over alleged illicit campaign financing. Morales ordered Velásquez’s immediate deportation from the country, arguing that the CICIG chief had meddled “in domestic affairs, which are the sole responsibility of the Guatemalan state.” But this declaration was derailed by the country’s Constitutional Court the same day, which declared that the president could not expel the lead investigator. As social movement pressure on Morales continues mounting, the majority of Congress is doubling down to protect the political elite from being accountable to the people for corruption. 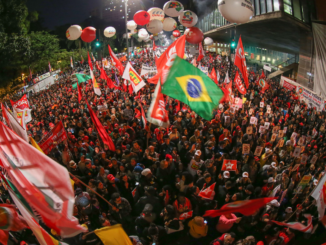 But a mobilization of outraged citizens, backed by the Constitutional Court, has stopped Congress’ brazen power move from going unchecked, and political elites have shown signs of backtracking under popular pressure. In record time without any debate, on Sept. 13 Congress rammed through Decree 14-2017 and 15-2017, which repealed anti-corruption legislation passed in 2015. Specifically, the decree changed who is responsible for managing donations to political parties, absolving Morales for the charges he faces for failing to declare the source of donations in his 2015 presidential campaign. The reforms also made it possible for anyone convicted of a crime that carries a sentence of less than 10 years to pay a fine rather spend time in prison. According to prosecutor Rootman Pérez, this would mean that many crimes – including extortion, embezzlement, and even some cases of murder, could lead to zero prison time. These reforms were provisionally suspended Thursday by Guatemala’s Constitutional Court amid widespread protest. Even before the court ruling, lawmakers showed signs of attempting to back-pedal, stating that the decision to pass the reforms was an “error.” Topping off the recent political circus, Congress voted 130 to zero Friday, Guatemala’s independence day, to reverse the controversial reforms. Local media characterized the decision as a response to social movement pressure. Members of Congress were met by angry protesters that surrounded the Congress as they arrived to vote on the reforms. The protest lasted for seven hours, blocking the lawmakers from leaving the building and increasing tensions. 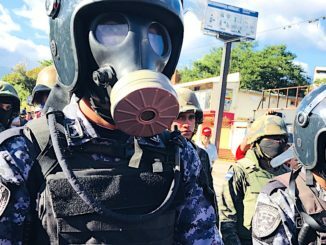 Finally, at nearly midnight, nearly 200 riot police deployed tear gas and pepper spray on direct order from Morales to disperse the protesters. Grassroots organizations and student groups have called for ongoing protests, including a national strike on Sept. 20. “The people have to come out, because if not, they’ll just continue with this plan — and it’ll get worse,” Manfredo Marroquín, president of the board of Acción Ciudadana, Transparency International’s Guatemala branch, told the New York Times. Marroquín’s comments are in response to Thursday’s proposed reforms, and underscores civil society’s role in keeping Congress in check and blocking any kind of gratuitous overreach or attempts at undermining CICIG’s work of dismantling corruption within the country. And the situation is poised to get worse. According to the Guatemalan daily newspaper La Hora, Congress is considering at least 3 other reforms that institutionalize impunity. And if recent action in the streets is any indication, further legislation that favors impunity will only draw more outrage from the population. Two days prior to the vote on repealing the anti-corruption laws, 104 of the 158 members of Congress voted against removing the president’s immunity, upholding his protection from prosecution. Only 25 voted for removing his immunity and 29 abstained. The vote came after the Supreme Court ruled on Sept. 4 that the president could face charges and deferred the decision on whether to remove the president’s immunity to Congress. And the fraud allegations reach all the way to the top of government. early two years after a massive government corruption scandal and large protests in 2015, investigators from CICIG, and the Guatemalan Public Prosecutor’s office, led by Attorney General Thelma Aldana, announced the filing of charges against Morales for illicit financing during the 2015 election. Grassroots organizations responded almost immediately to show their support for Velásquez and to demand the resignation of the president. 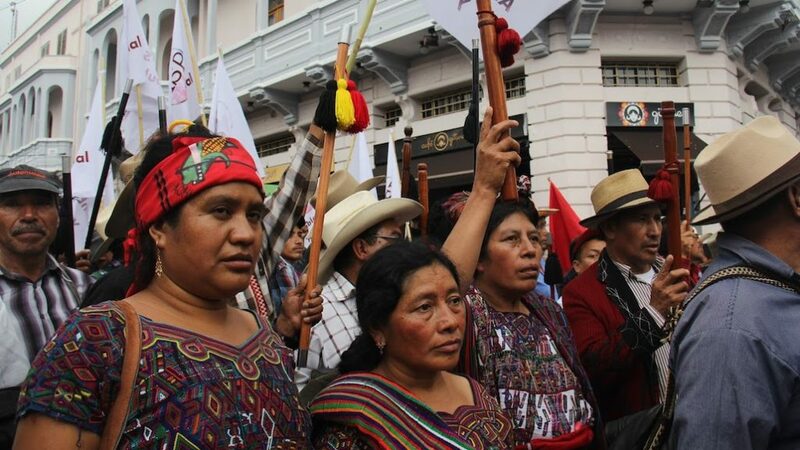 The coalition of grassroots organizations carried out a demonstration in the central plaza of Guatemala City, where several hundred campesinos and supporters gathered. Protests continued for days in front of the offices of CICIG, where both those in favor of Velásquez and those against him gathered on opposite sides of a police line. As the demonstrations outside the CICIG occurred, nearly 30,000 campesinos from the largely Indigenous municipality of Sololá blocked highways to protest the president’s call to remove Velásquez. Morales exploited the crisis in his presidential campaign with the military-backed FCN-Nación political party by promising voters that he was neither “Corrupt or a Thief.” But the latest scandal exposes the extent to which corruption and impunity have burrowed their way into the state in the more than two decades since the return to democracy in Guatemala. Thousands across Guatemala mobilized following the move to repeal the anti-corruption laws. Protesters mobilized outside Congress in Guatemala City and in towns across the country to slam the impunity that still plagues the Guatemalan political system two years after the former president and vice president were forced out of office. CODECA and the other organizations have stated that the protests will continue and escalate if the president does not resign. The campesinos associated with CODECA have been at the forefront of the pressure on Morales since he entered office in 2016. Since he took power, the organization has carried out at least four major protests against the president. These actions have included protests in the capital city, as well as full scale nationwide shutdowns, where campesinos blocked highways across the country. In July 2017, CODECA carried out two days of blockades along major highways across Guatemala. “We are going out and asking for the resignation of the president, his cabinet, and the 158 [congressional] deputies,” wrote representatives from CODECA in their statement to the press. Morales’ frustration with CICIG also stems from the organization’s failure to investigate CODECA, according to an article by the Guatemalan daily newspaper Prensa Libre, which called CODECA a “headache” for the embattled administration. But CODECA’s Vay points out CICIG is welcome to investigate the organization, maintaining it has nothing to hide. The organization has continued to promote a national constitutional assembly that seeks to re-found the state, one that represents all citizens. The assembly would involve writing a new constitution that reflects the diverse country, where up to 60 percent of the population of 15 million people is Indigenous. Yet this proposal is easier said than done, as the elite interests within the state seek to maintain their impunity. 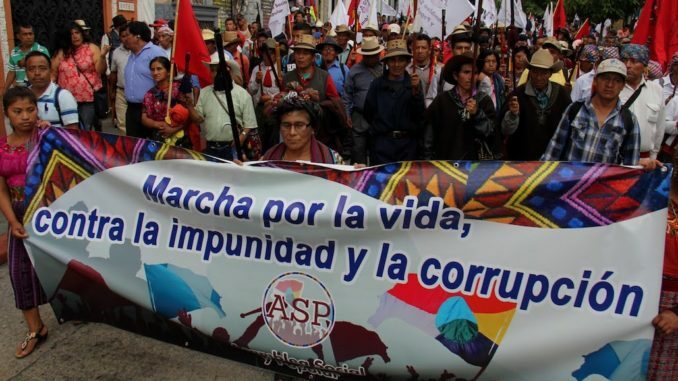 The mobilization of grassroots organizations represents the first step in rooting out corruption and illicit interests within the Guatemalan political system, but there is still a long way to go to forming a state that represents the needs of all Guatemalans. Jeff Abbott is an independent journalist currently based out of Guatemala. His work has appeared at The Progressive, In These Times, and the North American Congress on Latin America. Follow him on Twitter @palabrasdeabajo.